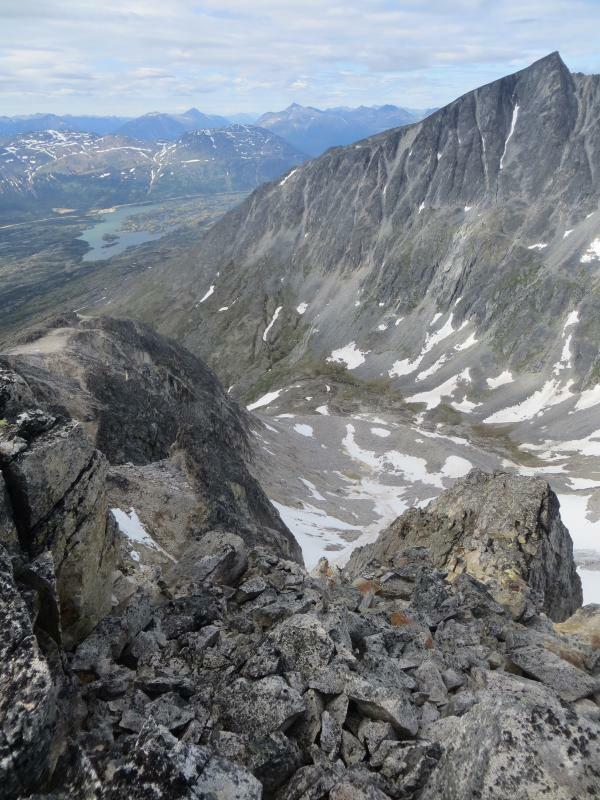 From Whitehorse, drive south on the Alaska Highway and take a right at the Carcross Cutoff onto the South Klondike Highway. Drive south on the South Klondike Highway towards Skagway, Alaska. Immediately before reaching the Canada Customs at Fraser, BC, there is a large parking area on the left. Park next to the White Pass Railway lines. 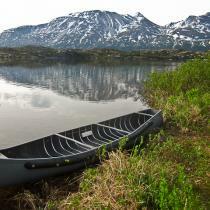 You will need a canoe or kayak to reach the actual trailhead on the south side of Bernard Lake, 2.8 km away. The paddle should take you approximately 45 minutes. The time and distance indicated above does not include the paddling time. 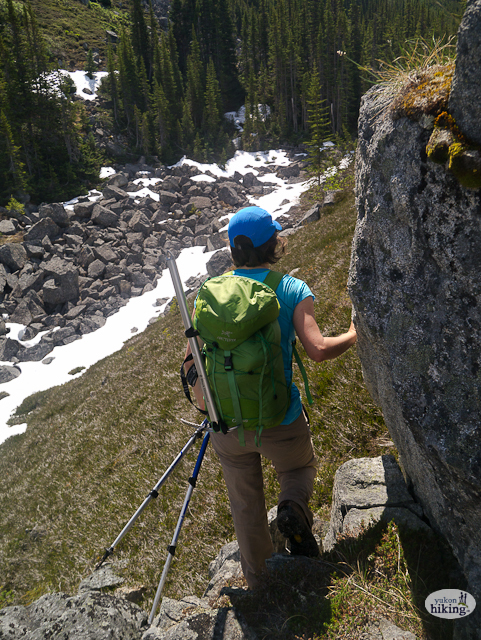 You must have good route-finding skills for this hike to avoid much of the subalpine forest bushwacking in the lower elevations and to navigate the snow and boulder fields on the upper sections. 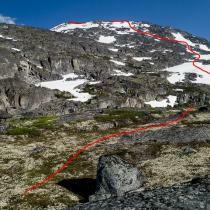 Recommended timing for this route is early- to mid-summer. 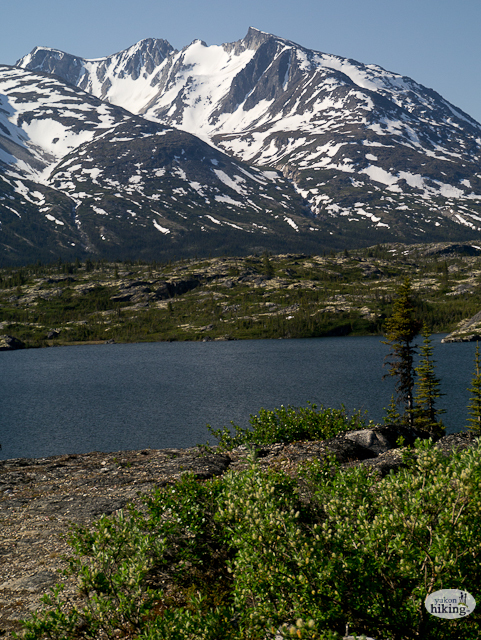 The distance and duration listed for this hike are for the hiking portion of this route, where the trailhead is located on the southeastern end of Bernard Lake. Due to the length of the hike itself and the fact that you need to paddle to and from the trailhead, this route is well suited for camping overnight. 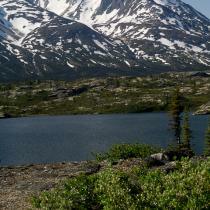 It is possible to find a suitable camping spot on the rocky ridge just above the lake. From the southeastern corner of the lake, head up towards the first rocky bench above the lakeshore. There are some good camping spots in this area. Drop down and south from this rocky bench and continue uphill to the next rocky ridge, which leads to the southwest. 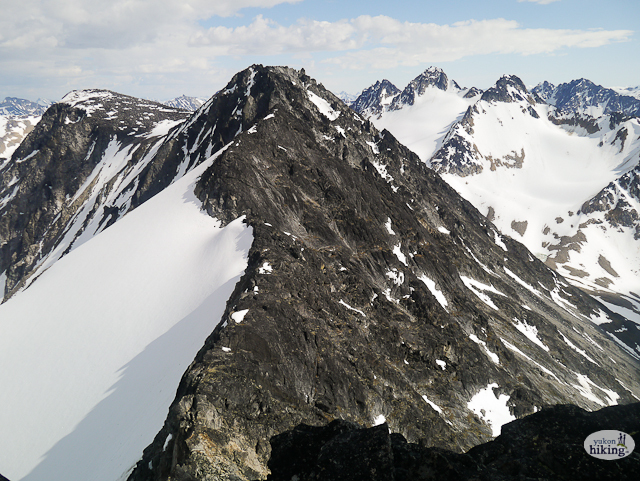 This ridge will eventually meet up with a large boulder field, which lies along the base of a gully. As mentioned before, good route finding skills will be a necessity, and a GPS with the hike track and waypoints will be an asset, as the route is difficult to describe. 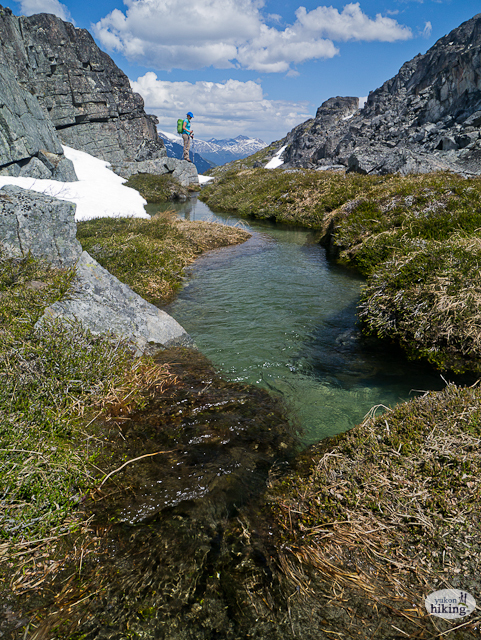 You will continue southwest, gradually gaining elevation, following along a series of boulder fields and small rocky ridges, occasionally dropping down to pick your way through the subalpine fir and hop across a small creek and wetland complex. The aim of heading southwest along this boulder field gully is to hit a suitable spot where you can head up a steep, open slope above the boulder field gully, avoiding much of the subalpine fir forest and steep rock walls that cover much of the lower section of the mountainside. 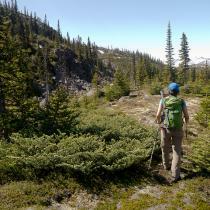 Once you are out above the treeline, the route finding becomes easier. 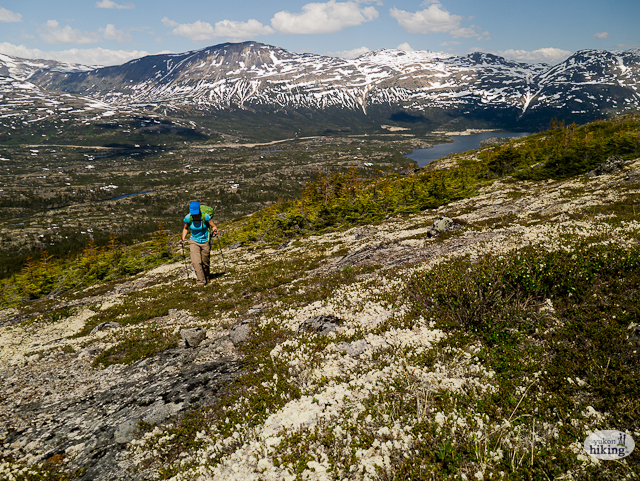 Start hiking straight up to the base of the mountain on the grass and lichen covered slopes. 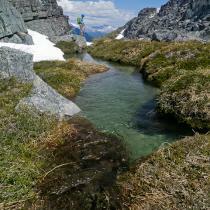 You will have to drop down through a small rock band to a small stream before heading back uphill again. 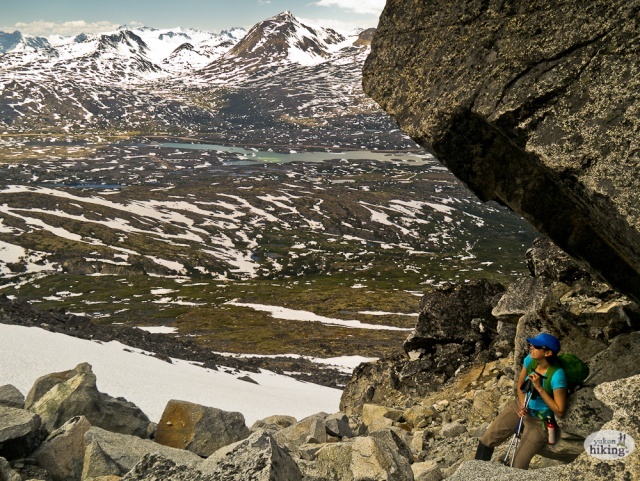 When you reach the base of the mountain, look for any large snow patches, as these will be the easiest to follow up, otherwise you will be hiking up boulders which might slow you down. Continue up the mountain (staying on the snow patches if there are any). Up high there will be a cliff band. It is not worth climbing up or through the cliff band, as it is easily skirted around by keeping lower and heading slightly northeast. To your left, you will see some steep, mossy steps about a hundred meters below the cliff band. Once you find your way around the cliff band, you start to see more of the route to the top. 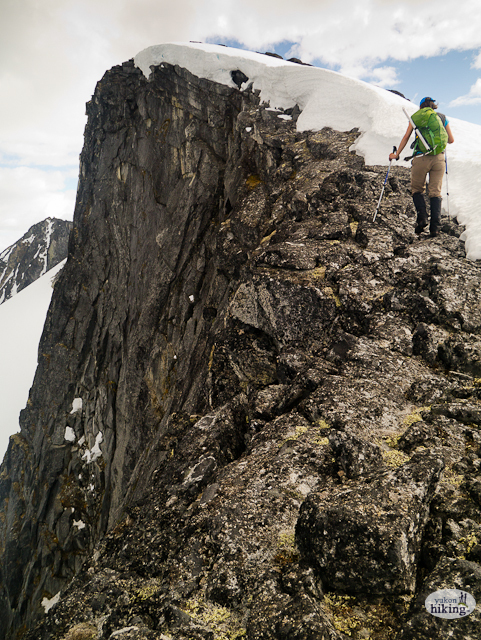 Just keep hiking up towards the summit. 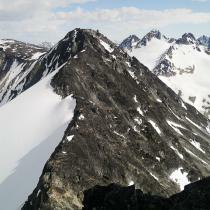 You will reach a false summit before you reach the distinctive Shark Fin summit ramp. The left side of the Shark Fin might have a cornice and the right side slopes down to a drop off, so just hike up the middle of the ramp. The view from the summit is great. You can finally see behind the peak to the mountains and cirques further east. To the southwest are numerous glaciers on rugged mountains. 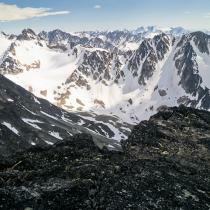 Below you is the moonscape area of the White Pass summit. To descend, follow the same route down. 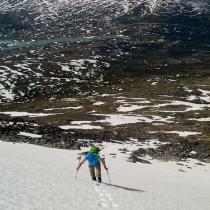 Here again, any snow patches will make the descent much faster. 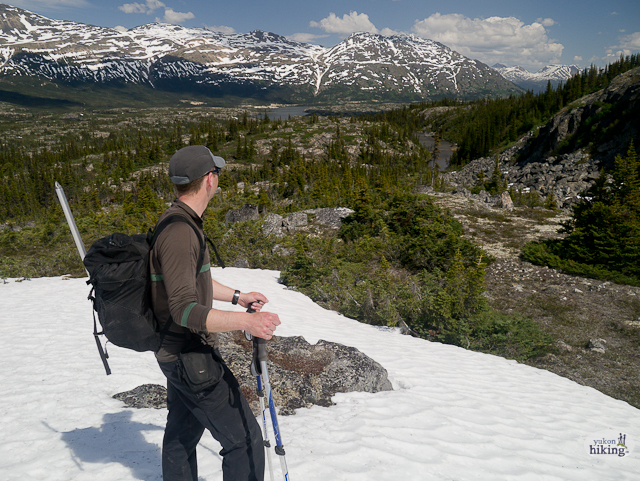 Some of the snow patches are steep, so if the snow is hard packed, you may need a mountaineering axe to descend them safely. If the snow is soft, it should be easy enough to just walk down the slopes. Take care to arrive back on your original route when you get down to the forest. 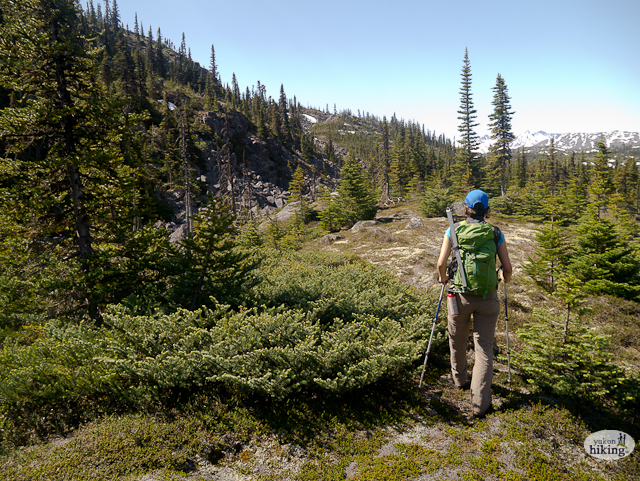 It is not recommended to try to take a short cut, as you may end up bushwhacking longer than your original route would take. A GPS is handy for arriving back on your route. Have you been to Shark Fin lately? Shark fin and Bear bluff! 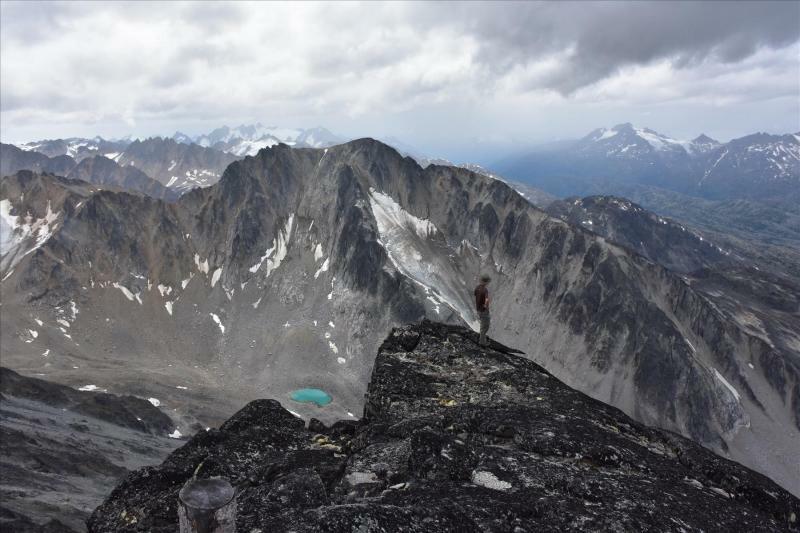 On August 10-11th 2018, François led an ACC trip with Myriam and Randi to the Shark Fin at White pass. 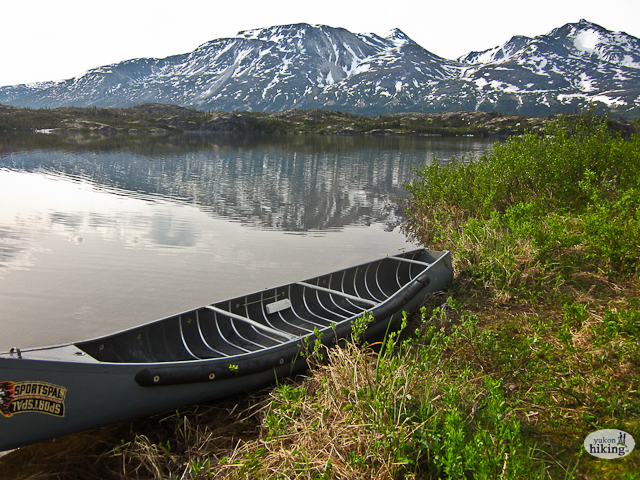 This hike is particular since a boat is needed to cross Bernard Lake. 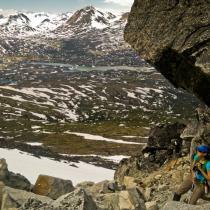 We left town after work on the Friday and drove, paddled and set up camp on a rocky hill at the south end of the lake. The goal was to be already at the trailhead in the morning. 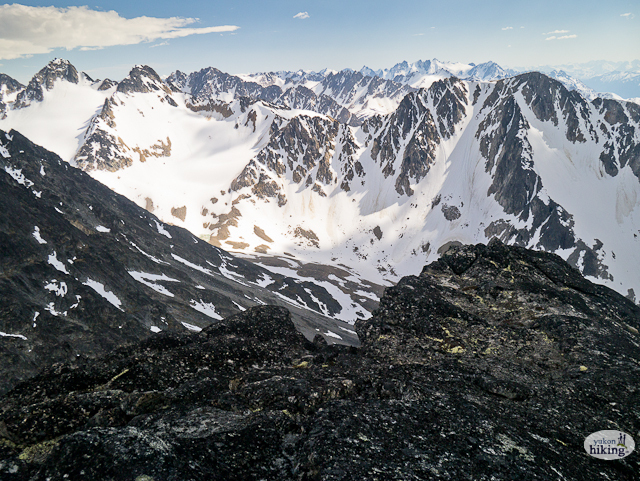 Weather wise, we were pretty lucky and had a clear view of our objective while clouds were rolling across the valley on Taiya peak. The bushwack was minimal to gain the alpine, but we were definitely louder than usual in order to avoid another bear encounter. 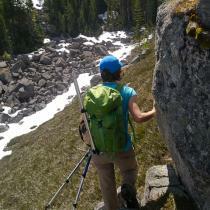 About a quarter of the hike is on various size boulders, which slowed down the pace a little bit. At this time of the year, there was no snow patch left to ease our progress. Lots of wildflowers were out. We were very glad to hit the ridge and see the massive walls of the Shark fin. 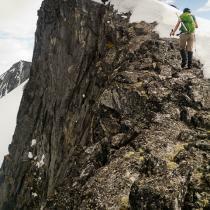 From there, the terrain got easier and we were quickly on the summit, enjoying some lunch around 1pm. Anyone knows how that log got to the summit by the way?? the above description is good, however, the bushwacking is no where near as bad as implied (at least if one is used to bushwacking in southern BC. Also, one can head pretty much directly from the location labeled 'Potential Camp' to 'Creek 2' This makes the route a little more direct. After Creek 2 there is a lot of brutal loose boulders/rocks/scree in late August. 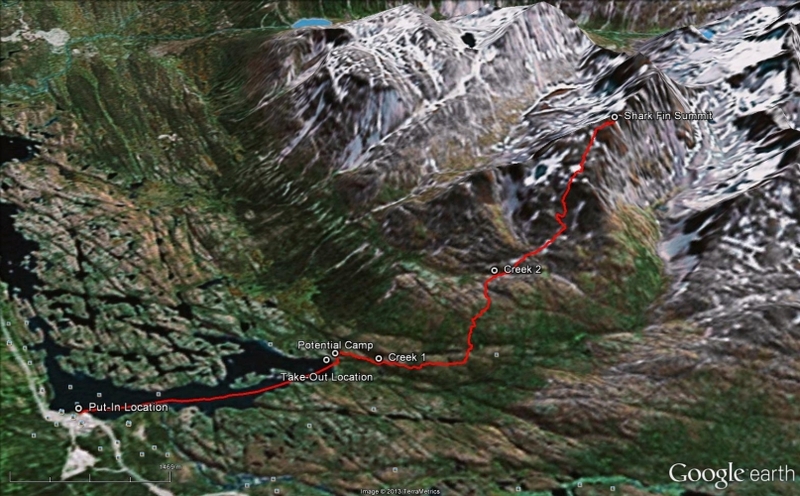 I imagine doing it in late July would offer more snow to walk up / down on avoiding some of the treacherous rocks. 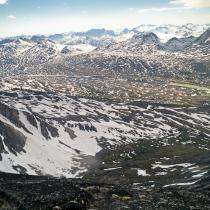 The views of the terrain from the summit are phenomenal! World Class! Two of us hiked to the top of Shark Fin on June 14th, 2014 in mostly good weather, but with a lack of visibility at times and near-blizzard conditions at the top 300m or so. 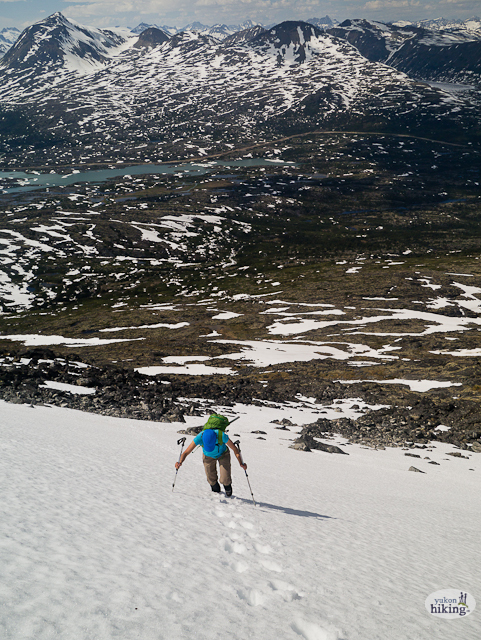 First, the snow-covered routes are a great way up in summer conditions but it should be understood that they are steep and anyone attempting the hike should have, at least, a basic understanding of avalanche awareness. Second, an interruption in our visibility caused us to end up below what may be the high cliff band mentioned in the trail description, and to travel through the rock band below. 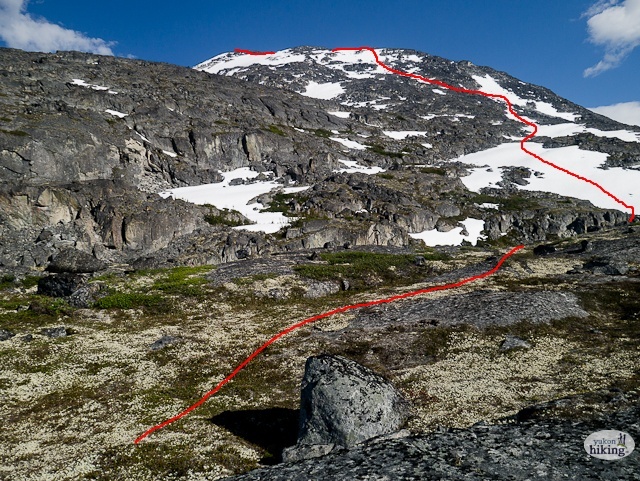 It should be noted that this is not just an undesireable route but a dangerous one with a steep pitch and many loose rocks of all sizes, and is an area that should be avoided. Ella: Yeah, you definitely climbed the peak next to Shark Fin! Now you really have a reason to go back. Nice photo, it really shows the Shark Fin peak from that angle. This hike was definitely an adventure! 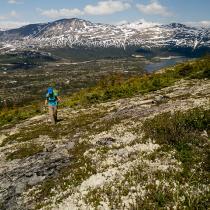 We did this hike at the end of June 2013. 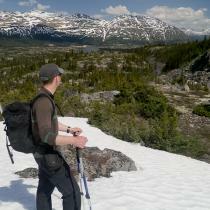 Lots of bush-wacking, rock hopping, river crossing and snow sliding. We attempted Shark Fin without a map though and the consequence was we might have climbed the wrong mountain oops! 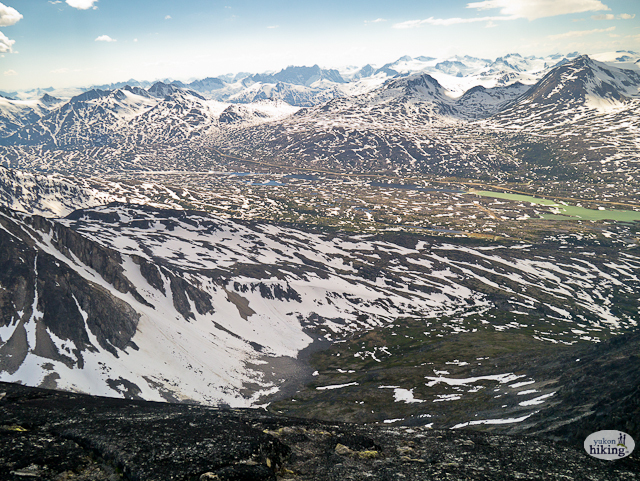 It took us fourteen hours from the car to cross the lake, climb the peak and return again. Here is a picture from the top looking down on the lake. Can anyone tell if we actually climbed Shark Fin? We will definitely be going back! This summer found a iPhone in the marshy area and river near the spot where you had left your canoe for the hike.